#toddlerapprovedtuesday is still running, this month, it's right through to 1 January! Link up with any toddler or pre-school posts, use #toddlerapprovedtuesday on twitter or instagram. You post doesn't have to be new, link anything you feel is relevant. 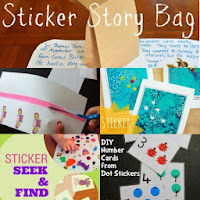 This week, I'm linking some pinterest ideas for using stickers in play, something that can be done nice and quietly when our children need 10 minutes to unwind from the excitement! Wishing you a very merry christmas, I hope you have a lovely day and I look forward to seeing what you have for us this week.